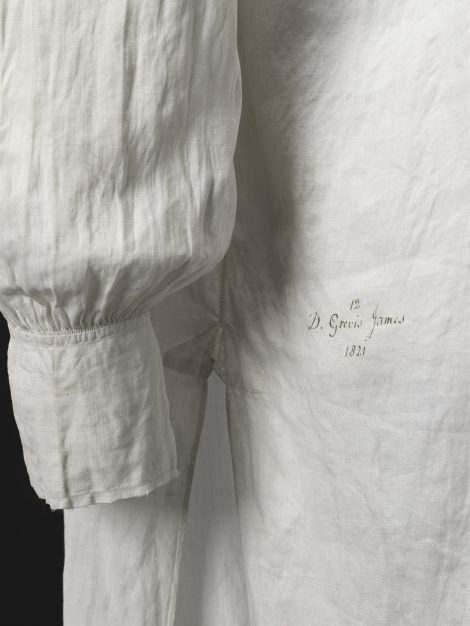 Men’s shirts, and women’s underwear, were very often marked or embroidered with the owner’s name or initials, the date, and possibly an identifying laundry number. 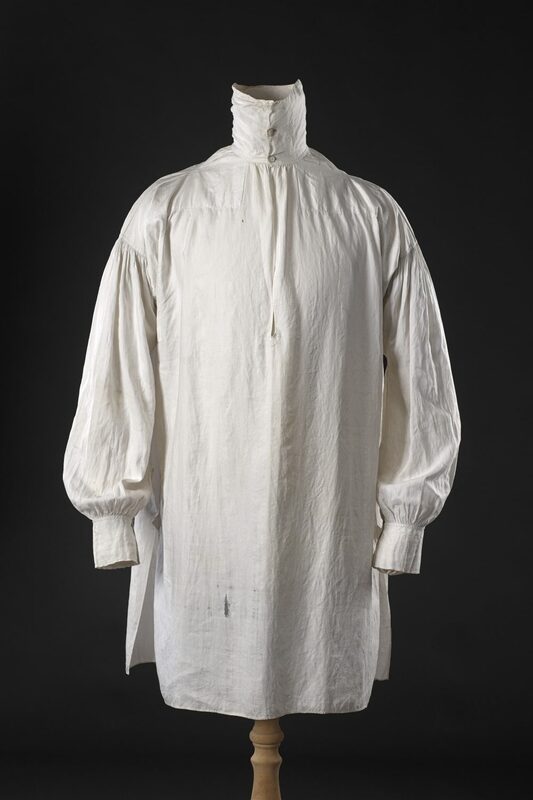 In this case the distinctive surname, Grevis James, identifies the owner with some certainty as Demetrius Grevis James, 1776-1861, of Ightham Court, Kent, establishing that the shirt was worn by a middle-aged man of good social standing. 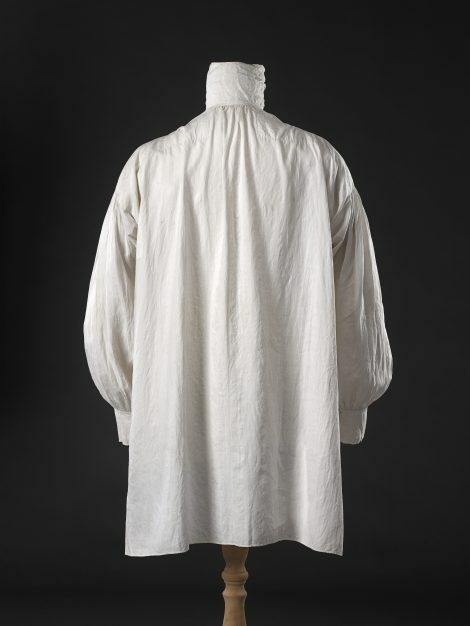 As a captain in the Royal Marines Grevis James served with the victorious Horatio Nelson at the Battle of Copenhagen in 1801, later becoming a magistrate and Deputy Lieutenant of Kent, and, in 1833, High Sheriff of the county where he was responsible for the redistribution of parliamentary constituencies following the Great Reform Act of 1832. 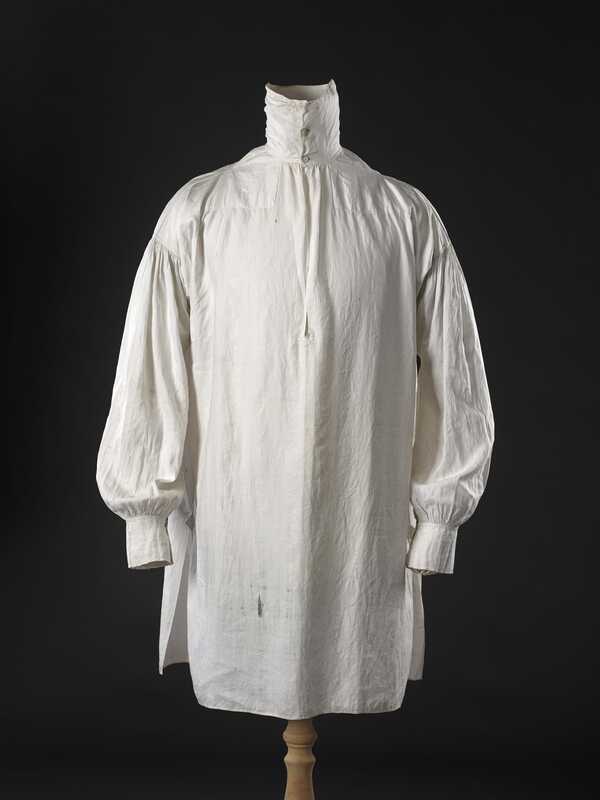 No doubt a man of conservative taste in clothes, Grevis James’ shirt is of a style little changed from the previous century. 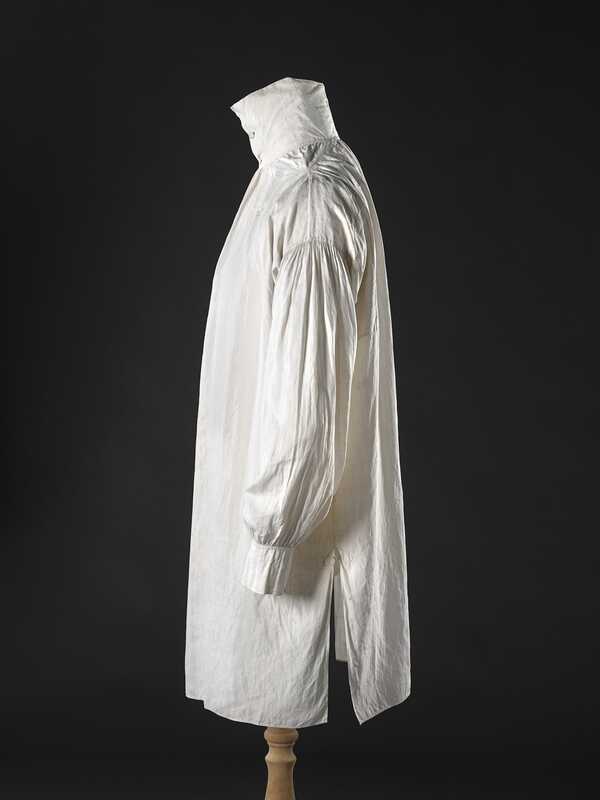 Made, probably at home, of fine quality linen as would befit his status, the cut of the body and sleeves is straight and full, based on rectangles to make best use of the cloth. 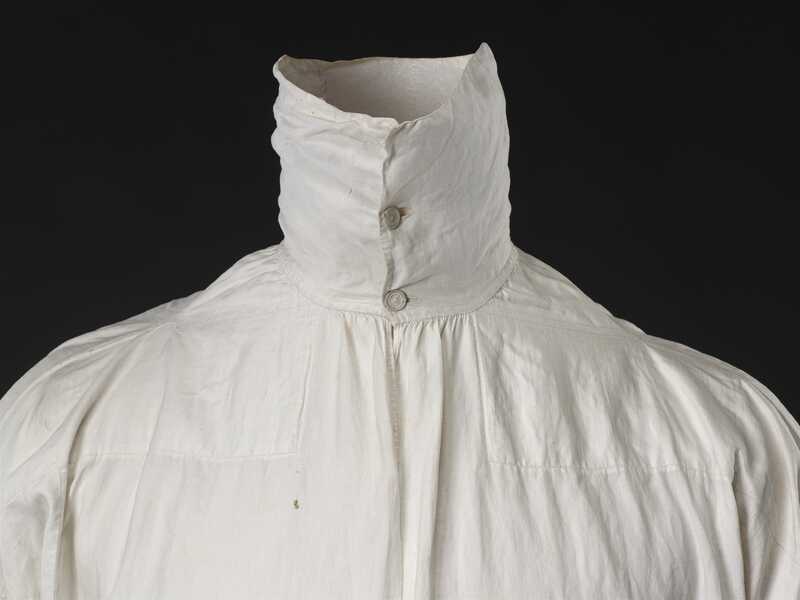 Minimal shaping is provided by square gussets, folded diagonally on each side of the collar and at the armholes. The shirt is reinforced against wear and laundering at the shoulders, armholes, base of the front opening and top of the slit at each side seam. 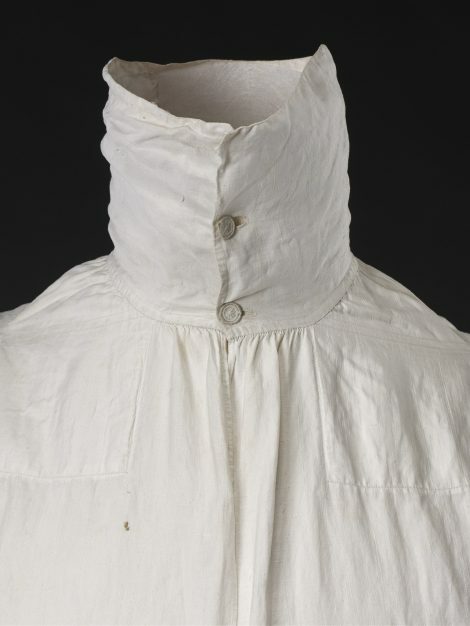 The high collar, which has a sliver cut out at the back to accommodate the base of the head, and the cuffs are fastened with thread covered Dorset buttons.